LG G2 is much better than S4.cpu processor and camera rock on g2. S4 is not so good. 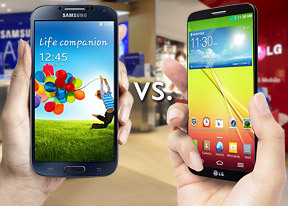 LG is much bettet brand than Samsung. I do not owe S4 so I'll just comment on G2. Phone is nice. Speed and battery the best. Accessories like headset and charger still in good condition unlike some that won't last a few months. However,after 1 yr and 3 mos,my phone starts to flicker. I have to switch it off and on the screen to stop flickering. They said its a software defect and they aleady resolved this issue on their new released phones. I am just a bit dissappointed bec it still new and now looking for a new phone. I have both phones,so I can compare them. Camera is better on S4,pictures are sbarper,I have more details. I like better screen on S4,i love vibrant colours,but I think that is better because it has much better sunlight legibility.And the sound is better on S4. Also, a big plus is that it has a slot for a memory card. But I do miss fm radio.G2 is Is quite faster, has no lag-impressive. Battery life on G2 is phenomenal,and I love it.I do not play games,but G2 is clearly the winner in tabta section. ahmad, 20 Oct 2014G2 better in all departments than s4 eexcept the CAMERA !! I have used both... Colors n sharp... moreI agree for the camera. G2 better in all departments than s4 eexcept the CAMERA !! 2.personally, I really like the placement of the power and vol buttons on the back. It's natural for me the way I hold a phone. LG put thought into so it functions well and doesn't cause unwanted effects like accidentally ending a call or activating when sat onto a surface. Not just a novelty aesthetic. I have heard rumours that the G2 has expandable storage and replacable battery in Korea. Is this really true? Please answer if you know about this. Thanks. 1) Does the G2 have 4.4.2 Android version yet? 2) Does the lock button make matters difficult? 3) Would you recommend this phone to someone? Is it good enough to buy? I would be very grateful if you helped! G2 good phone as compared to S4 this S4 becomes to hot while using it or charging it.